When using a condition step in Flow there's two modes that you can apply. This is the familiar "click and select" concept where you choose your condition and the field value. This is where you can make additional adjustments that is not available through basic mode. This is what we will use for AND OR statements. Why? In basic mode you cannot set more than one condition in a Flow condition step. OK, this is where I give you my explanation. Disclaimer: I am not a developer and the terms I use is what makes sense to me. It is not the official explanation but this is how I have understood it which has helped my learning and adoption of Flow. In a Flow condition step, it is calling a function to pass single or multiple parameters using some logic. You must use Advanced mode to be able to extend the function to have more than one criteria. In my Flow condition, I was checking that the Customer equals Stark Industries and Product equals AI Support. Again, here's my explanation of what the function is in Advanced mode. Similar to AND but this time using OR instead. This one I figured out on my own. What I was able to work out is there's different parts to the function. We use "Group And" and "Group Or" clauses. In red is the two grouped OR conditions where the Product field value equals AI Support or Iron Man Armor. In Dynamics 365 we are used to seeing the Name of the lookup value when referencing a related record in a condition. In Flow we need to reference the GUID of a lookup value since it uses the odata APIs of Dynamics 365. In Unified Interface, it's easy to get the GUID in the URL. If you export and import a Dynamics 365 workflow from a source instance into a target instance that references a related record through a lookup in a condition step, the workflow will not execute as expected if the record does not exist in the target instance. Same principle applies in Flow so make sure the record does exist in the target instance. Otherwise when the Flow is imported into the target instance and the GUID does not exist, you're going to run into a problem. Notepad++ is your best friend when it comes to making sure that you are not missing any close brackets which is what I demonstrated in my vlog. Notepad++ will highlight your brackets in red and it makes it easy to see where you are missing a close bracket. To perform multiple conditions to use AND OR statements, and Group, you need to edit in Advanced mode to enter the correct function. It might appear as hard at first however you will get the hang of it. As mentioned earlier I am not a developer, but I was able to understand the concept of edit in Advanced mode when configuring the Flow condition step. In case you haven't watched my announcement video on my new WTF vlog series (What the Flow), here it is. The purpose of my WTF vlog series is to help you extend your existing knowledge of configuring Dynamics 365 workflows and how to replicate this in Flow. Flow uses the odata APIs of Dynamics 365 and as a result of this, how you configure in Flow is somewhat different to Dynamics 365 workflows. You may freak out. You may pull your hair out. You may think Flow is stupid. Yes - I have mentally experienced this but once I overcame it I loved Flow. There's so much capability that Flow unlocks that we didn't have in Dynamics 365 workflows. I know, it is hard sometimes to let go of what you are already familiar with however you're not going to know unless you try. This is my first episode of my WTF vlog series. In this episode I talk about the difference between a Dynamics 365 connector and a Common Data Service [CDS] connector in the context of defining scope for Flow. "Scope" is already a configuration we are familiar with in Dynamics 365 workflows. I thought it would be a good idea to kick-off my WTF vlog series with this since it is a configuration you normally set prior to configuring the Dynamics 365 workflow steps. When configuring Dynamics 365 workflows one of the configurations is to set the scope of a workflow as this will determine which users will trigger the workflow. For more information on scope for Dynamics 365 workflows please check this out. How do I replicate scope in Flow? 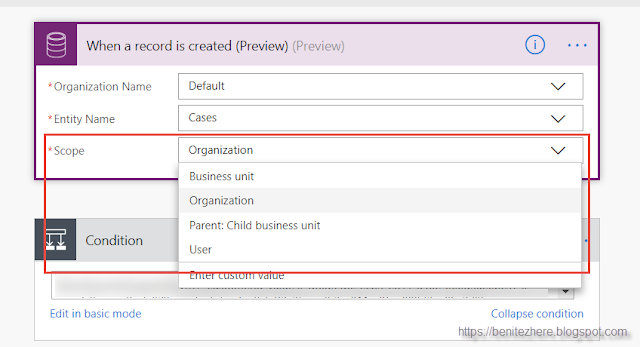 In a Dynamics 365 connector, you cannot set the scope. The Flow will always be triggered organisation-wide. 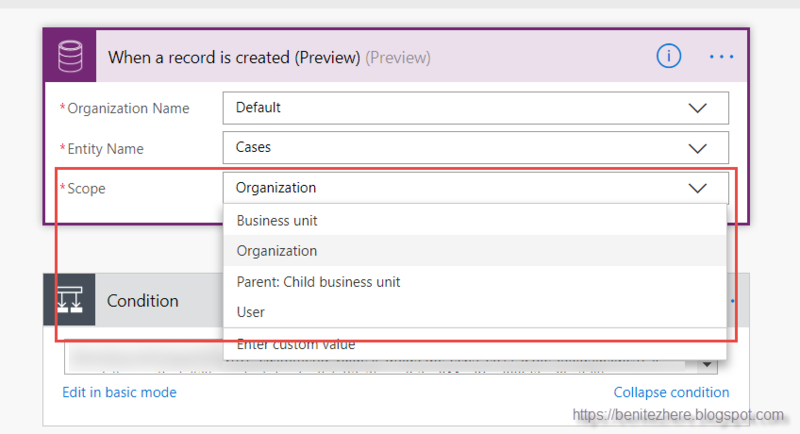 In a CDS connector, you can set the scope like how you currently can in a Dynamics 365 Flow. However as Andrew Ly pointed out in his blog, there are Flow premium connectors. Notice how some CDS connectors have a Premium label. I'm not a licensing expert but here are details of Flow plans. If you have questions on licensing I suggest you ask them in the Microsoft Flow community. This will be familiar to you if you already know how to configure Dynamics 365 workflows in Flow. Set the desired scope in the CDS connector such as "Organization." That's it. You've learnt your first "how-to" in Flow. Congratulations! Setting the scope in the CDS connector will replicate the existing functionality of Dynamics 365 workflows in scope. This means that the OWNER of the Flow defines which users will trigger the Flow. What I demonstrated in the vlog is the following use case scenarios. The same Dynamics 365 workflow principles apply to Flow in regards to the defined scope. Although the vlog was longer than this blog post, the vlog demonstrates that what you already know about configuring scope for a Dynamics 365 workflow and how it defines which users can trigger the workflow also apply to Flow. In the next episodes I will begin to cover the configuration steps in Flow. I will start with how to do AND OR statements in a condition step. This is something you are already familiar with in Dynamics 365 workflows today but in Flow it's different which you'll learn in my next episode.